Part of living in New York City is accepting that stress-factors are everywhere -- high rents, shady landlords, and massive train delays included. The city is not exactly a good place to unwind. 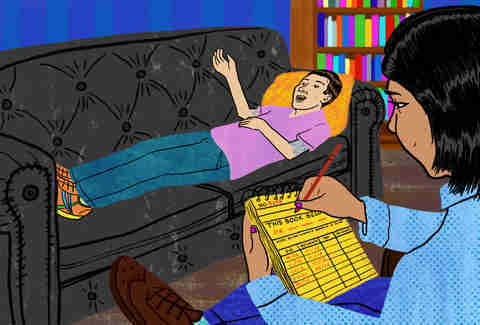 While talk therapists and psychiatrists are invaluable resources for those dealing with clinical mental illness, the city is also home to another kind of therapist for those with more routine stresses: a bibliotherapist, who doles out books instead of medication. Bibliotherapy is exactly as it sounds: an individual (not necessarily a practicing doctor) evaluates the state of your psyche through a series of probing questions, and ultimately, writes you a prescription. 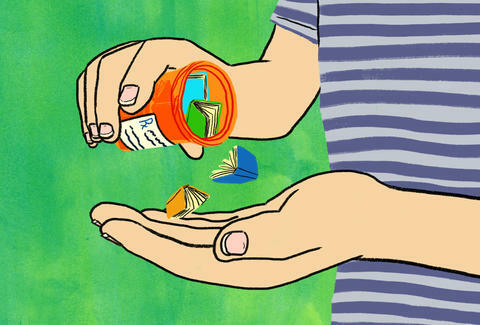 But rather than offering you an Rx slip, the bibliotherapist’s prescription is for 12 books -- one per month for a full year -- curated specifically to your maladies. While the concept of literature as therapy dates back as far as Greek Antiquity (the entryways of one of the earliest libraries was inscribed with the words, “the house of healing for the soul”), the term “bibliotherapy” was coined in a 1916 Atlantic Monthly article. Hospital libraries all over the US and the UK began to curate bibliotherapy programs for traumatized veterans and other patients, and in 2007, the London School of Life founded the world’s most popular bibliotherapy platform in its iconic bookstore. At present, there are a number of therapists, social workers, and kind-hearted librarians scattered across New York who offer prescribed reading lists as potential solutions for various ailments -- but Tomassi is the only one with a practice devoted exclusively to the use of literary remedies. Tomassi begins each of her sessions by asking her patients what, specifically, they would like to remedy through the practice of bibliotherapy. She requests some vague biographical information -- career, lifestyle, reading habits -- but spends the vast majority of the 45-minute block navigating her way through the nuances of the client’s specific issue. Roughly two weeks and several hours of research later, Tomassi produces a personalized list of prescribed books, each of which, she believes, will provide some solace or much-needed insight to the bibliophile at hand. Each title is listed in a PDF with a brief explanation of the text and why, exactly, it relates to the patient’s needs. The books included in Tomassi’s standard prescriptions are not self-help books, nor are they pop psychology manuals -- they are works of fiction. “A book on dealing with debt will never be as revealing as Dickens’s Little Dorrit,” she explains. “Tolstoy is a genius at describing the many ways we love, both destructively and generously -- I truly believe stories makes us better people.” At the CFF, your assigned reading list is built purely of fiction and literary non-fiction, carefully selected with the understanding that a novel, when consumed at precisely the right time, can be life-altering. Who actually goes to bibliotherapy? A 45-minute bibliotherapy session at The Center for Fiction is priced at $150 -- a bit less than the standard $200-300 NYC therapy session (and you only have to show up once for a full year’s prescription). Tomassi agrees that in many circumstances, psychiatry is a fundamental, necessary resource. But she operates her practice around the notion that great literature, in certain cases, can make us feel more understood than all of New York’s Yale-educated therapists combined. “There are several studies that go so far as to suggest that when we read, our breathing patterns change. Our bodies begin to slow themselves -- to relax,” Tomassi says. She believes that in a city that rarely finds the time to slow down, it’s important to find some sort of pause, if briefly. Books offer us permission to slow down a little -- they provide us with some good company when the whole city feels hostile. And while literature doesn't replace the need for a trained medical professional in all cases, it is a way to combat a little bit of the stress that New York so effectively cultivates -- and that is precisely Tomassi’s intention. If nothing else, a year of prescribed reading will certainly make the L train that much more bearable. Eliza Dumais is a freelance writer with a particular knack for self-medicating.